Average Up - Averaging Up - What Does It Mean? 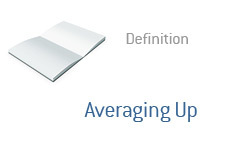 What does it mean to "average up"? What is the definition of "averaging up"? Averaging up is when you buy additional shares of a stock that you already own at a higher price than what you initially paid for it (or, at a higher price than what your average price in the stock is). Example #1: You currently own 100 shares of Google (GOOG) that you purchased a few months back at $400 per share. Google has since moved up significantly from your original purchase price, but you believe that the stock will move much higher over the days, weeks and months ahead. You decide to purchase an additional 100 shares of Google at $500 per share. You have "averaged up", meaning that you now own 200 shares of Google at an average price of $450 each. Example #2: You have decided to slowly scale into a stock, purchasing 100 shares on the first business day of every month. After 10 months, you own a total of 1,000 shares at an average price of $10 per share. The first business day of a new month rolls around, and the stock is currently trading at $15 per share. You buy 100 shares of the stock, meaning that your average price is now $10.45 per share. You have "averaged up" in the position. That's the definition of "averaging up".